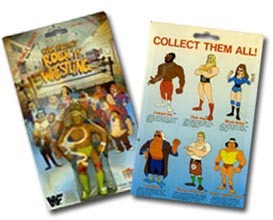 For those of you unfamiliar with the Rock 'n' Wrestling erasers, they are a figure line based on the 80's WWF cartoon of the same name. These figures are becoming very hard to find. As far as I know, this is the only site devoted entirely to this line of figures. (Probably the only site devoted to erasers period.) I'll be sharing all of the info I have on these great collectables, as well as pictures of my collection. I've been pursuing this set since 1998, and in that time amassed the most complete collection anywhere. I say most complete because there very well could be some variants out there that haven't surfaced yet. So far, there appear to be 8 different erasers: Roddy Piper, Iron Sheik, Wendi Richter, Junkyard Dog,2 Hulk Hogans, & 2 Jimmy Snukas. (This is not including my "mystery eraser"
which you can check out with the link below.) A lot of times people confuse these erasers with the WWF LJN Bendies line. However these figures don't bend very well and are shorter (about 3.5-4" tall) than the LJN Bendies. When I first began collecting these, myself and the other collectors weren't even sure who existed and who didn't. Just because there were 6 figures featured on the packaging didn't mean all 6 were produced. Eventually, though all 6 began to surface. Still, not a lot is known about these erasers or the company that produced them, the now defunct Winston Toys (who also made a lot of other WWF related school supplies). And that's one of the reasons I enjoy these figures so much, the mystery & obscurity surrounding them. Why are there 2 versions of only Hulk & Snuka? And why are they exact replicas of their 8 inch LJN counterparts? Why are Piper and JYD the only figures that look like they're actually based on the characters from the cartoon, while the others all look a little more realistic? Why does Iron Sheik wear different colored boots? These are all questions that will be explored here on the site. Another thing I love about this line of figures is the challenge in completing the set. Most wrestling collectors out there are only now beginning to catch on to the rarity of these, as evident by the recent rise in eBay prices. And if you don't think they're rare, just try to find them. Unlike other more popular toy lines like Hasbro & LJN where pretty much any figure you need is always available on eBay, these guys don't show up very often. I never thought i'd be able to complete the set, but sure enough I have...at least for now. I find it odd that there would be 2 Hulks, 2 Snukas, and only 1 of everyone else, so you never know when a new variant might surface. To see and read about each figure, just click the links below. And don't forget to email with comments, stories, or any helpful info, I love hearing from fellow collectors.